Wearable smart devices are now far from a new technological segment fighting for popularity. A number of large companies have already shown their vision for this kind of gadgets. Garmin are definitely one of the manufacturers that has succeeded in the area and their devices are rapidly gathering admirers. Since we introduced you to the capabilities of the Vivosmart bracelet about a month ago, we’ve now reviewed one of Garmin’s fully sports oriented mechanisms – Vivofit 2. This band doesn’t allow you to read notifications from your phone, but it can still be connected to the Garmin Connect application so you can see detailed statistics of your sports activities and accomplishments and compare them to other people’s stats. Naturally, the function to monitor sleep is quite interesting. Another advantage is the battery life of over a year. Of course, we will cover all of Vivofit 2’s functionality, so if you’re a sports person who is also interested in new technology, you’re going to like this post. And even if you’re not, perhaps Vivofit 2 will motivate you to become more active and lose a couple of pounds. In addition to the band itself, inside Garmin Vivofit 2’s box there is an extra strap, USB cable for PC connection and some guides. We have the well-known rubber bangle combined with a two-color LCD display from the last model. The button which controls all the operations is noticeably more discrete and literally blends in with the design so you can’t tell it’s there on the right side of the screen. There is a little plastic snap in the end of the strap with 3 bumps meant to go in the holes on the other side. In order to make the link stronger and more reliable, Garmin made the plastic elements rotatable. The device and band weigh only 23g so it shouldn’t be a problem to get used to the overall sensation of wearing that. Besides, at its thickest point we measured only 10.8 mm, which is also a descent number. The bangle is only 3.5 mm thick. You can get a huge variety of colors from Garmin. One of the huge advantages of the band is its long battery life. According to Garmin it can be used for over a year and then replaced without worrying about cables and chargers. Moreover, Vivofit 2 has 5 ATM water rating which means that you can take showers or swim with it. One of the interesting functions of the device is to alarm you when you’ve stood still for a long time. When an hour has passed without any detected movement the wristband makes a sound to make you do something. Even a short walk will reset the timer. The thin red strip on the upper part of the display will also change every 15 minutes to remind you that you haven’t moved in a while. Activity timer – This is the first mode you’ll see when you hold the button. A second hold stops the timer. Afterwards the information will be updated on your profile. Synchronization – in order to send information from the band to the Garmin Connect app you must hold the button until a sign saying “SYNC” appears. Transferring the data then takes a few seconds. Sleep – Before you go to bed you can activate sleep mode. Then on your Garmin Connect page you’ll be able to see information about how much time you’ve slept and whether you’ve been moving around. This option doesn’t offer much, but it is a good to have it there. Connection – Whether you connect the wristband to a PC or a mobile device, you’re going to have to choose a connection mode when the Garmin Connect app tells you to. Once you press the button you’ll start going through the collected data – steps walked, daily goal, distance passed, calories burned, time and date. Vivofit 2 can also measure your heart rate if it’s connected to a heart rate monitor. Based on your activity levels the device generates a daily goal which will become harder and harder. You can win virtual badges and compare results with friends. Small additions that are meant to motivate you. For further statistics and calorie tracking you’ll have to make a registration in MyFitnessPal. There you can design a meal plan, track calories, fats, proteins, and sodium and sugar intake. You’ll get detailed information about how much pounds you’re going to lose or gain if you continue following your current meal plan and tips about health norms and nutrient intake. 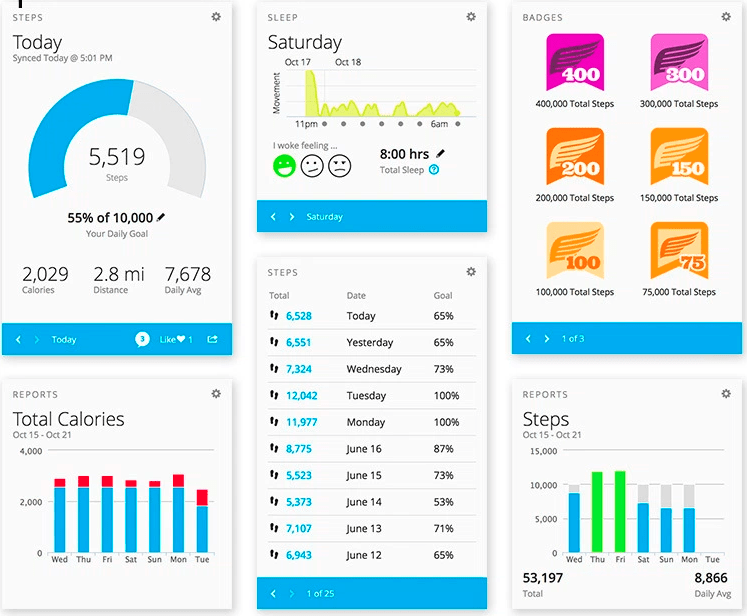 In order to take advantage of all capabilities Garmin and their Vivofit 2 have to offer, it is necessary to download the free Garmin Connect app, available for mobile devices and computers. Your phone must have Android 4.3 / iOS 7 or later and Bluetooth 4.0 or newer. You get detailed information about how many steps you’ve made and when you’ve made them; all of this goes straight to your page. On the same page you’ll find out how many more steps it takes to accomplish the daily goal, how many miles you’ve passed and how many calories you’ve burned. You’re able to make comments about every single day. By sliding right you can check your previous accomplishments. You’ll find a new chart here, showing when you had run and walked during the week. Beneath it is the information about the burned calories (Active calories + BMR Calories). As we mentioned above, for more detailed information you’ll have to use the MyFitnessPal app. In the sleep menu you get information about how many hours of sleep you get and what mood you’ve been in the last time you woke up. Further down there is another chart which shows if you’ve moved during the sleeping period. Again, by sliding right you can check the same information for previous days. Here you’ll find a weekly chart showing your progress. You can set a goal which will be shown with an interrupted line on the graphic. You have to keep updating your weight. Vivofit 2 isn’t an addition to your smart phone like most of the smart watches on the market. The idea of Garmin is to create a convenient and relatively affordable band for the sporty, or those who want to become sporty. There probably wouldn’t be any complaints if it had the functionality to view notifications from a phone, or link with GPS, but this would have probably made it more expensive. The wristband is small and light so it won’t interrupt your activities in any way. After a while you’ll completely forget it’s there and only the sound signals will remind you. In addition to that, you can sync the data from the device with your mobile phone or PC at any point, and analyze your results with the Garmin Connect app. The daily goals, the possibility to compare your results and win virtual badges serve as an additional motivation to be more active.